I'm going to try my hardest to give a review fitting of this masterpiece. I honestly don't know if that's possible because this author took me to a world that I want to live in. This is a quirky and addictive adaptation of the fairy tale Rapunzel that I found more appealing than the original. Her descriptions were second to none and her characters were absolutely amazing. Raya was whisked away to the island of bones at a young age for her safety. Her kingdom was being obliterated by a plague and her mother had only one request and that was for Raya to live. So she entrusted her friend the half-fae Hildegard to take her away. Raya begged for Hildegard to go back for her parents so she quickly spelled items to keep Raya fed and safe and left, never to return. For years Raya was by herself until Trevor washed up on her shore. While she was intrigued by the man she was also leery. 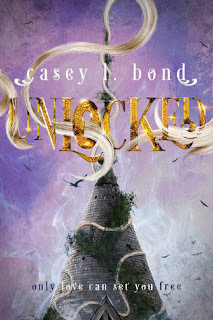 This is the first book that I've read by Casey L. Bond and definitely won't be the last. Her writing whisked me away to another world that absolutely captured my heart. This is not my regular genre nor was it my style but now I feel like I've been converted. I will be grabbing up everything by this author and you should too.